Ex-Stoke City defender Harvey Read, 20, has joined the Rocks - who have been hit by long-term injuries to FOUR central defenders this season. Read, who plays in the middle of defence, began his career at Southampton, had a spell at Eastleigh after his Stoke spell and recently played in Australia with Heidelberg Utd. French Midfielder Richard Gilot has also re-signed at Nyewood Lane a year after his first spell with the club began. He left at the end of last season after relegation from National South. 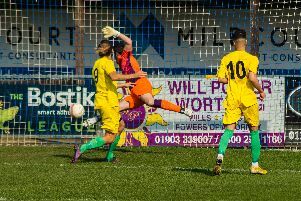 Both are in contention for Saturday's home Bostik premier tussle with Potters Bar - as are Pompey pair Brad Lethbridge and Dan Smith. They missed last Saturday's win at Burgess Hill - Lethbridge because of a groin problem and Smith because he was Pompey's '19th man' as they hosted Blackpool. The Rocks have won four out of their past six games and will be keen to build on that run against the Hertfordshire visitors.